– Lupita’s Interview in Vogue Magazine. 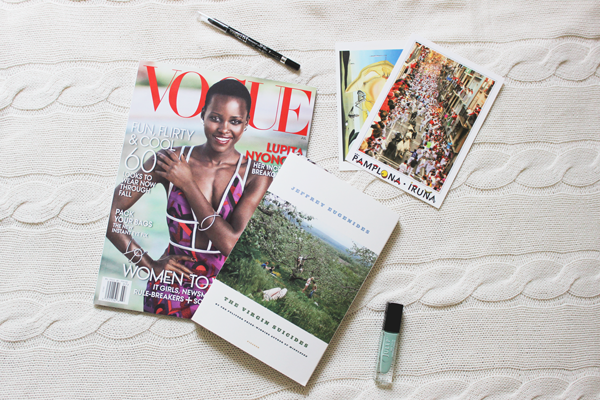 I was so excited when I saw that Lupita was going to be on the cover of Vogue. I finally got around to reading her interview and it was so good. I continue to admire her and if you’re a Lupita fan, you’ll definitely want to check out this interview. – Julep Nail Color Kam. I may have like six other mint green nail polishes, but they’re all different. This one by Julep is my new favorite of the bunch and you can see what it looks like on my nails here. – The Virgin Suicides by Jeffrey Eugenides. I was really excited to read this one. I posted a picture at the beginning of last month and several people commented about how much they love this book. I finished it recently and thought it was so good. The longer I think about it and reflect on it, the more I like it. At some point soon, I’ll watch the movie directed by Sofia Coppola. – Rimmel ScandalEyes Waterproof Kohl in Black. I was looking for an eyeliner that I could use on my waterline and this one works really well. It’s so creamy and smooth. Now I need a new eyeliner pen for cat eye flicks because my previous one dried out. Any recommendations for one that makes it easier to do a cat eye for an eyeliner noob like me? – Postcards from my best friend. I’ve already mentioned these in my wanderlust post, but it was certainly the best mail that I received all month. Tell me: What were your July favorites?